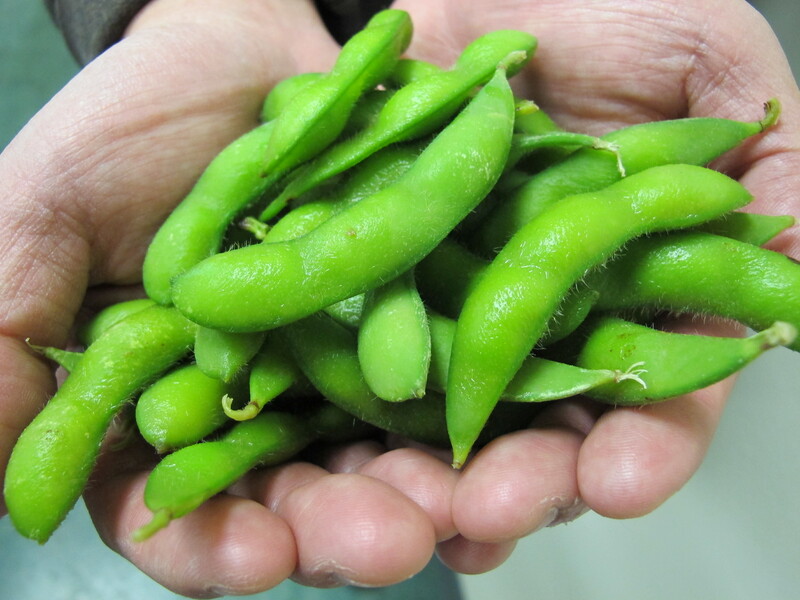 Edamame: Is the future of American soy farmers' profits in edible soy beans for people? MULBERRY, Ark. A small but growing number of farmers have been experimenting with an edible soybean as they look to capitalize on Americans' interest in adding non-meat proteins to their diets. The United States is one of the world's top soybean producers, but most beans grown here are used to make cooking oil and feed farm animals. They aren't eaten whole. Now, some farmers from Arkansas to Minnesota are planting a type called edamame, which is commonly used in Asian cuisine. Food trend experts and farmers say edamame remains a niche product  somewhere between chia seeds and quinoa in popularity  but they see potential for growth if food companies can figure out an efficient processing system for a crop that must be harvested and packaged quickly. Plus, with meat prices rising, Americans are interested in less expensive, alternative proteins. And possible marketing worries, including the notion that soybeans are livestock food, have faded. "Soy has not historically been viewed as being an edible crop in the U.S., but now, with more people becoming aware of Asian foods like tofu and edamame... and more people adopting plant-based diets," things are changing, said Ray Chung, who runs an Arkansas plant billed as the first one in the U.S. dedicated to processing edamame. Harry Balzer, chief industry analyst for The NPD Group, a consumer market research firm, said he's seen a trend in cost-conscious consumers looking for alternatives to meat. "If you can make my proteins cheaper by providing me with an alternative protein source, I think you have a wider market because now you're talking about money saved," Balzer said. It's not clear how much edamame is being produced in the U.S. because the Department of Agriculture doesn't distinguish it from other soybeans. But trade groups, such as the American Soybean Association and the Ankeny, Iowa-based Soyfoods Council, agree that the amount is small, and most of what Americans eat now comes from Asia. Farmers who are testing the edamame market have mostly started small. Ray Gaesser has been planting about one-tenth of an acre on his farm near Corning, Iowa. His main business comes from some 6,000 acres of soybeans and corn. "Growing edamame is the same thing as growing a conventional soybean. It's the harvesting that's the difference," said Gaesser, who is also first vice president of the St. Louis-based American Soybean Association. Farmers typically plant soybeans  edamame or otherwise  in the spring. The plants sprout, grow leaves and flowers and, eventually, bean pods. Most commercially produced soy is left to dry in the fields before its seeds are harvested to make oil and animal feed. Edamame, on the other hand, is picked when the bean pods are green and tender. "Once it's harvested, you've got a certain amount of time to get it to the processing plant to get it processed or you start losing quality and you start losing product," said Jeremy Ross, an extension soybean specialist at the University of Arkansas Cooperative Extension Service. Gaesser has been growing edamame for several years now and said he would consider planting more, but there's not a processing plant close enough to his farm to make it practical. In Arkansas, Chung and his father convinced nearby farmers to grow some 900 acres of edamame last year for his company, American Vegetable Soybean & Edamame Inc. He plans to increase that number this year, although he wouldn't say by exactly how much. He wouldn't allow The Associated Press to talk to his farmers, either, citing confidentiality agreements. Chung is protective of his company's share of what he estimates is a $175 million to $200 million market, with 25,000 to 30,000 tons of edamame being consumed each year in the United States. All the edamame frozen at his plant about 140 miles northwest of Little Rock is grown in the U.S. Chung and Gaesser said that edamame could be more profitable for farmers than other kinds of soybeans. Chung's company is selling now to stores including Sam's Club and Whole Foods. Someday, he hopes to export American-grown edamame to Asia, where people have been eating it for centuries. "There's a big middle class that's emerging in China, and they're becoming more educated about food choices," Chung said. "And so, to them, when they see a `Made in the USA' label... they want it."